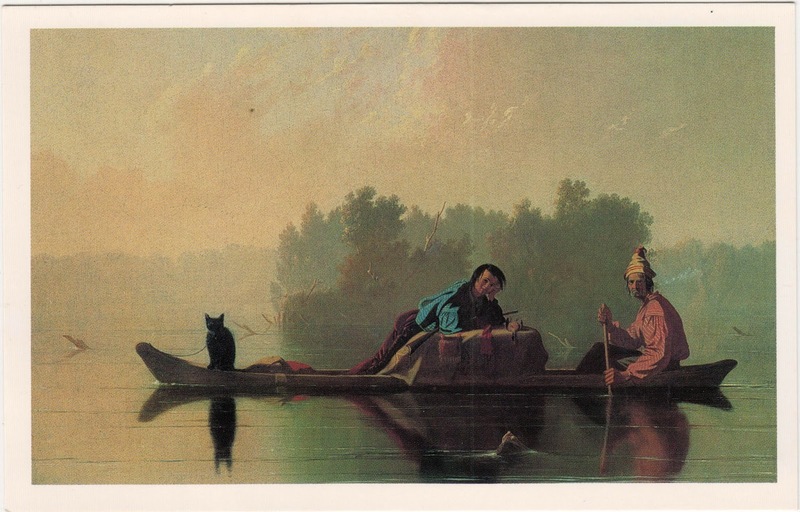 Outgoing postcard US-3139095 to Russia shows one of the most famous paintings by George Caleb Bingham, a 19th century American artist. Depicting American life in the frontier lands along the Missouri River using the Luminist style, the painting was originally entitled French-Trader, Half-breed Son. It reflected the reality of fur traders' common marriages with Native American women. However, the name was changed to Fur Traders Descending the Missouri to avoid potentially controversial when it was first exhibited. Painted around 1845, this art piece is now owned by the Metropolitan Museum of Art in New York. The stamped card was one of the EXTRAordinary Art Card series issued by USPS at the Saint Louis Art Museum in St. Louis, Missouri on May 4, 1990. It has a 15-cent postage pre-printed with a reproduction of the 1845 painting and sells for 50 cents at the time. The liberty cap or Phrygian cap worn by the older man was the symbol of freedom and liberty commonly used in the 19th century. The animal in the boat was actually a bear cub, not a cat.